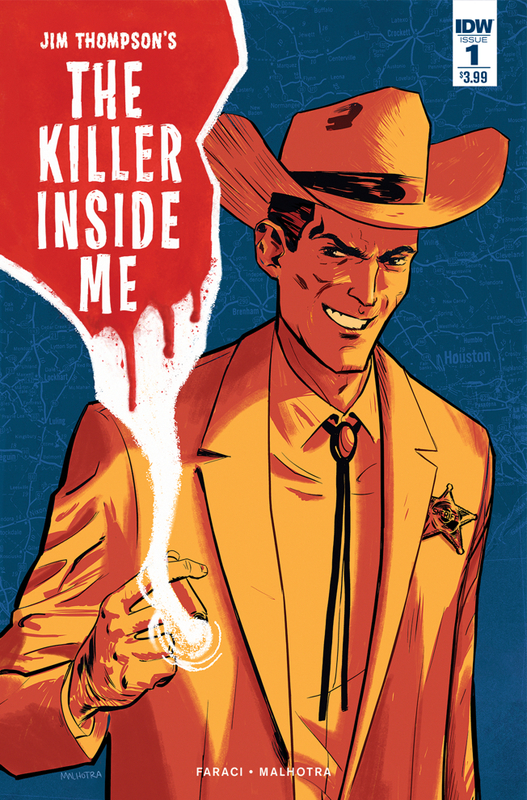 The Fellowship was fortunate enough to obtain a copy of JIM THOMPSON’S THE KILLER INSIDE ME #1 from IDW Publishing. Devin Faraci writes, Vic Malhotra draws, Jason Millet colors, and Christa Miesner letters. Lou Ford is a small-town cop. He’s a pretty nice guy overall, though he has a bit of a temper and he likes to mess with people’s minds a little in conversation. He’s done a remarkable job over the years of hiding that feeling, the one that makes him want to hurt people. But the man who had his brother killed is really starting to test him. He’s got a few other triggers going on as well, but no more spoilers here. This is an adaptation of the 1952 novel, and it was an unusual look into the mind of a killer back then. And on top of that, this is a good first issue, giving us a look into several of the characters and a glimpse of where the story is going. The art works really nicely to convey the small town in Texas and the relaxed pace thereof. Dark psychological stories like this one have become all too normal these days. But it’s good to look back at how these kinds of stories got started. To examine the roots of the genre, if you will. Go get this book. 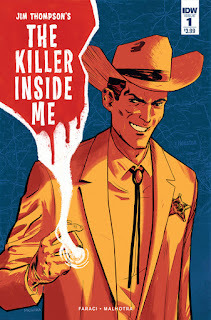 JIM THOMPSON’S THE KILLER INSIDE ME #1 is available now at your FLCS or at idwpublishing.com.